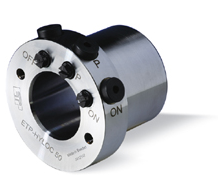 The robust ETP-HYLOC locking bush is ideally suited to different environments, high loads and medium shaft sizes. Mounting and disassembly is fast and clean. Torque and axial loads can be adjusted by the applied mounting pressure. Typical shaft sizes are 50 to 200mm. ETP-HYLOC is based on a hydromechanical principle. The connecting element consists of a doubled walled steel sleeve with an integrated movable conical piston. In the flange there are 3 threaded connections ("ON","P" and "OFF") for radial and axial connection. This allows radial or axial connection during assembly/disassembly. Assembly/disassembly is carried out using a hydraulic pump. The piston is driven up the tapered chamber by the hydraulic pump, expanding the sleeves onto the shaft and hub and creating a secure connection with partially high radial load capacity. During assembly, the piston is moved in the opposite direction and the connection is broken. A small amount of oil pressurised through port P runs in a spiral track and lubricates the surfaces, making it easier for the piston to move. For dimensions and performance data go to Support & links and click on CAD-file. High transferable torque, which can be varied by altering the assembly pressure. Fast assembly/disassembly even in limited space. By using a hydraulic pump, assembly time is reduced to a minimum, even with large dimensions. Radial and axial connection possible. Sensitive hub adjustment can be carried out during assembly. The best store builder by ShopFactory powers D496. All-in one store builder and eCommerce software.